Are you looking to get away from it all? Unwind? Relax? Rejuvenate? Well, New England has several spa resorts and yoga retreats that can fill the bill. Here's a sampling of some of New England's healthy escapes. The "land of ahhhs" is closer than you think! This spa escape in the Berkshires of western Massachusetts offers you a chance to be as active or inactive as you wish. Among the many offerings, you'll find private health assessments and consultation, touch therapy, spiritual wellness, meditation, acupuncture, cooking classes, hair and skin treatments, aquatic therapy, yoga and so much more. Activities: Canyon Ranch offers a full array of spa services, fitness activities and opportunities for increased spiritual awareness, health and healing. Dining: Healthy, gourmet selections are what you'll find at Canyon Ranch. Accommodations: Your all-inclusive stay will feature meals, spa services, fitness activities and accommodations in the 126-room inn; choose from a deluxe room, executive room or a luxury suite. Guests must be at least 14 years old. Arrangements may be made to accommodate small dogs. Rates: Rates start at $939 per night. Package rates vary depending upon the season, the length of stay and services desired. Reviews: Read Canyon Ranch reviews on TripAdvisor. For more information: Call toll free: 800-742-9000. This country spa resort owned by the Mashantucket Pequot Tribe is the perfect place for a healthy retreat. The setting? Forty-two acres of perennial gardens, woodlands, and natural spring-fed ponds. Aren't you breathing easier already? Activities: You'll discover a full selection of body treatments; body wraps; beauty treatments; fitness activities; programs for renewal of mind, body, and spirit; tarot card readings; Ayurvedic rituals and more. Dining: Kensington's Restaurant serves traditional New England cuisine with a wide range of vegetarian and vegan options. And Ascot's Pub offers traditional New England tavern fare with a twist. Accommodations: Stay in the Georgian-style inn, dating to 1929, or choose a private villa with a cozy fireplace and added privacy. Reviews: Read reviews of the Spa at Norwich Inn on TripAdvisor. For rates and more information: Call 860-425-3500 or toll-free, 800-ASK-4-SPA. 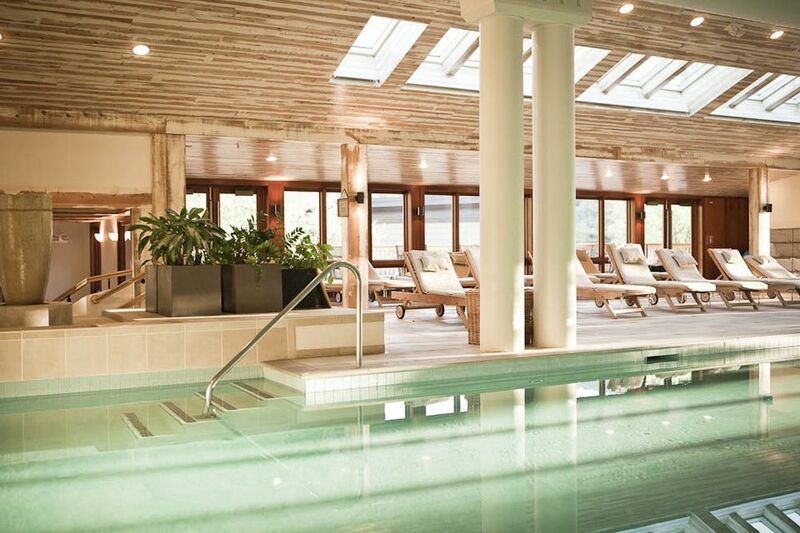 Vermont's Topnotch Resort offers a 35,000-square-foot spa, complete with a skin care clinic, beauty salon, solarium, year-round heated pool, weight training and fitness classes, all without sacrificing the pleasures of a Vermont mountain resort. Activities: You'll find more than 100 spa treatments and fitness programs and packages that allow you to plan a customized, healthy escape. Dining: The menu at Flannel, the signature restaurant at Topnotch, features fresh, Vermont-harvested ingredients. Accommodations: Choose a hotel room or suite or your own resort home. Online reservations are available. Reviews: Read Topnotch Resort reviews on TripAdvisor. For more information: Call 802-253-8585 or toll-free, 800-451-8686. If it's sanctuary you're seeking, then turn to this retreat in the Berkshires of western Massachusetts that Newsweek magazine has called one of seven "unspoiled, unique destinations" in the world. Activities: The emphasis at Kripalu is on looking inward, and you'll find workshops on yoga, meditation and YogaDance—a unique combination of yoga and aerobic dance. Health services, including massage, touch therapy, skin and body care and more, are also offered. There is also a private beach on Lake Mahkeenac for swimming and sunning. Accommodations: Choose from private, semi-private or dormitory-style accommodations. All lodging facilities are simple, without telephones or televisions. Rates: A schedule of fees for healing arts services is available online. For overnight accommodations prices, register online or call the number below. Reviews: Read Kripalu reviews on TripAdvisor. For more information: Call 413-448-3152 or toll free, 866-200-5203. You can also use this online form to request a copy of the retreat's comprehensive program catalog. Think summer camp for spiritually enlightened grown-ups. This eclectic retreat in neighboring New York State offers a busy schedule of programs designed to nurture mind, body, heart and spirit. Omega guests can take advantage of the property's natural setting to really breathe deeply and stretch, whether participating in yoga therapy, practicing mindfulness or attending workshops. Activities: The workshops, conferences and retreats Omega hosts are many and diverse, and you'll also be able to fill your days with yoga, Tai Chi, meditation, movement classes, wellness center appointments and healthy meals. Accommodations: Although day guests are welcome ("commuter fee" required), to enjoy the full benefits of a wellness escape, spend a few days in this inspiring setting, where simple lodgings range from camping sites with a shared bath facility to deluxe cabins with a private bath. Rates: Per-person rates include three meals per day, use of facilities and a daily schedule of programs and activities. Additional charges apply for course tuition and wellness services. For more information: Call 845-266-4444 or toll free, 877-944-2002.